Good weather leads to more playing. More playing means better players. But is this true? After all, it’s well-known that the best player in baseball, Mike Trout, is from cold-weather New Jersey. Many quickly point to the fact that California, Texas, and Florida are at the top of the list for states with the most MLB draftees, but they’re the three most populous states. Perhaps proportionally they don’t stack up to colder states after all. 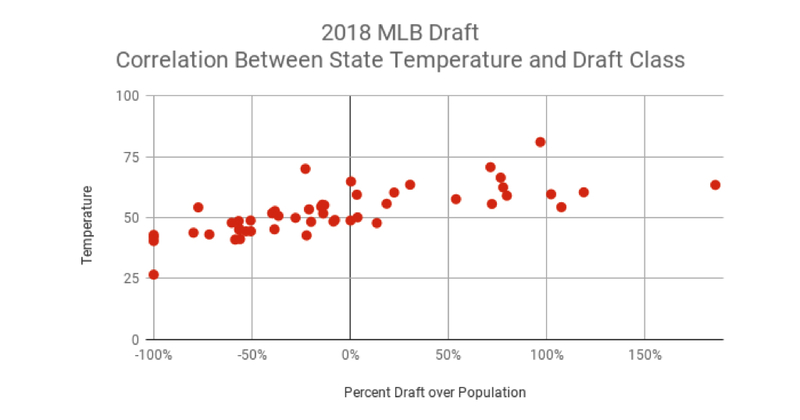 I decided to look at the data from the last two drafts — 2017 and 2018 — to see if there is a relationship between a state’s average temperature and how well its players do in the draft. Do warmer-weather states really produce more MLB draftees than average?